Made in the U.S.A., Summit's gas cooktops offer lasting quality and reliable cooking. 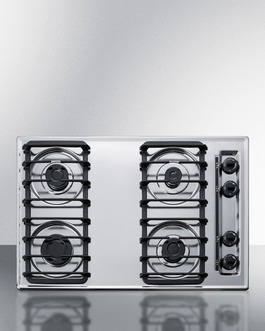 The ZTL053S is a 30" wide 4-burner cooktop designed for 28 3/8" W x 18 5/8" D cutouts. The scratch-resistant chrome surface features a recessed design to better contain spills. The side-located push-to-turn dial knobs offer easy use. Two sets of continuous cast iron grates are designed to hold up to heavy pots and pans. Four sealed Sabaf burners with removable burner caps ensure safer and cleaner cooking. The ZTL053S includes a high output 12000 BTU burner for powerful heating, conveniently located in front for easy access. The rear 5000 BTU burner is ideal for simmering at lower power or keeping food warm without overcooking. Two standard 9100 BTU burners meet most cooking needs. This unit utilizes electronic spark ignition and includes a pre-installed 3-pronged cord. The ZTL053S is set for natural gas and can be converted to propane connections with the purchase of our Kit LP S2. Additional choices are available in black and white, as well as in 24" and 27" wide fits. Browse our site for more.